Before you can scan drawings, you must have a scene, element and drawing list ready. You can create these directly from the Scan application without having to go through the Control Center. Start the Scan application and log on to the database using your Harmony user name. Select the Environment and Job in which you want to add a scene. In the Scene Name(s) field, type the new scene’s name. Press Enter/Return after each scene’s name to create additional scenes. 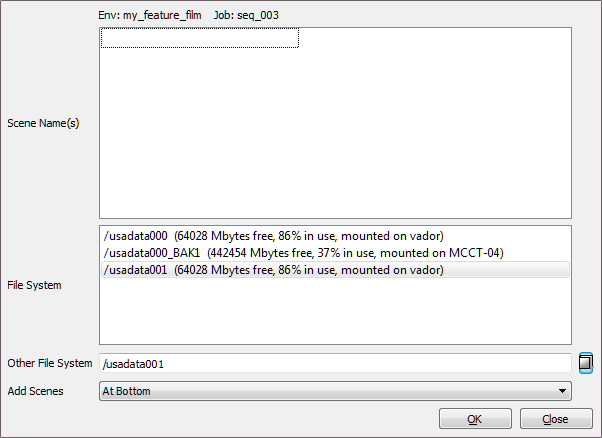 From the File System list, select the file system. Click the Other File System button to select another file system to use. To learn more about creating a project in the database, refer to the Control Center Guide. 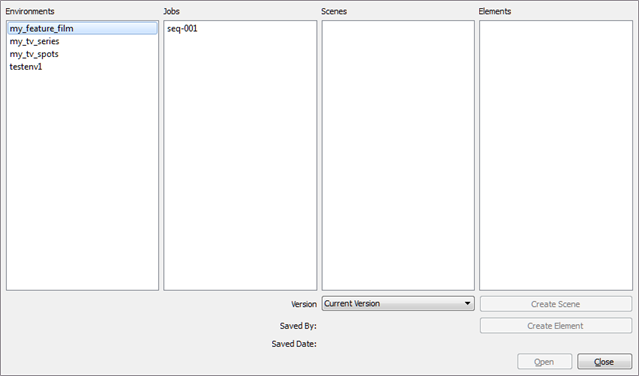 Select where you want to place the new scenes in the database scene list using the Add Scenes menu. At Bottom: Places new scenes at the bottom of the scenes list. At Top: Places new scenes at the top of the scenes list. Name Sort: Sorts new scenes alphabetically.